Yesterday was my birthday, and today I’m just older. I had one of the best days ever, mostly due to Cj and his talent for spoiling me, but first, Monday’s eats. I don’t remember what breakfast was, but I sure as heck remember lunch. 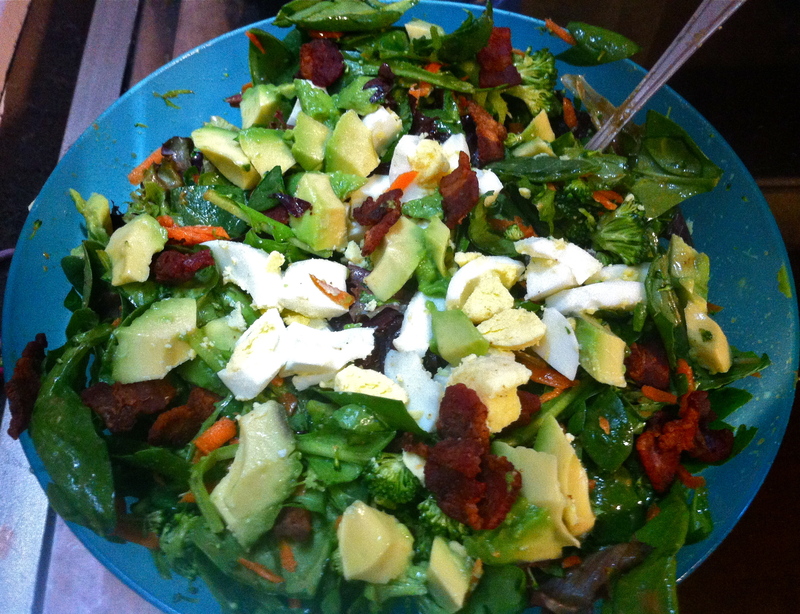 A spinach and greens salad topped with bacon, a hard egg, avocado, broccoli, and my favorite mustard balsamic vinaigrette. I’ve been trying to eliminate all sugar from my diet (though in a few minutes it doesn’t seem like it), so I finally stopped using my beloved hot & sweet mustard from TJ’s and switched to regular spicy deli mustard. Still good, but damn I like the sugar. Luckily for my blood sugar levels dinner was sugar-free as well. I finally got myself to cook up a whole chicken. 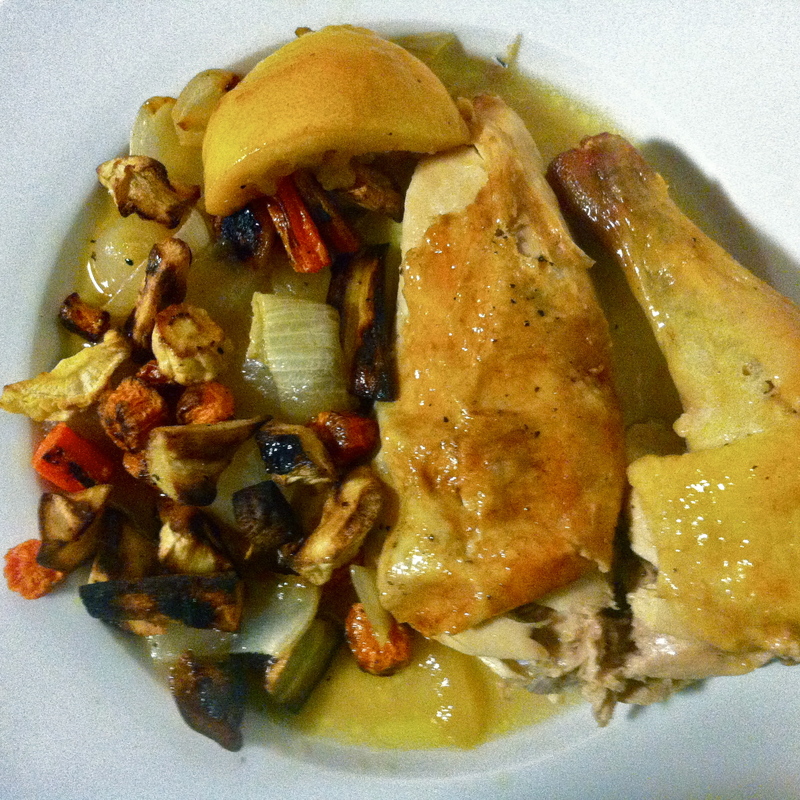 I used a recipe from one of Ina’s cookbooks (love that woman) for “Jeffery’s Roast Chicken”. 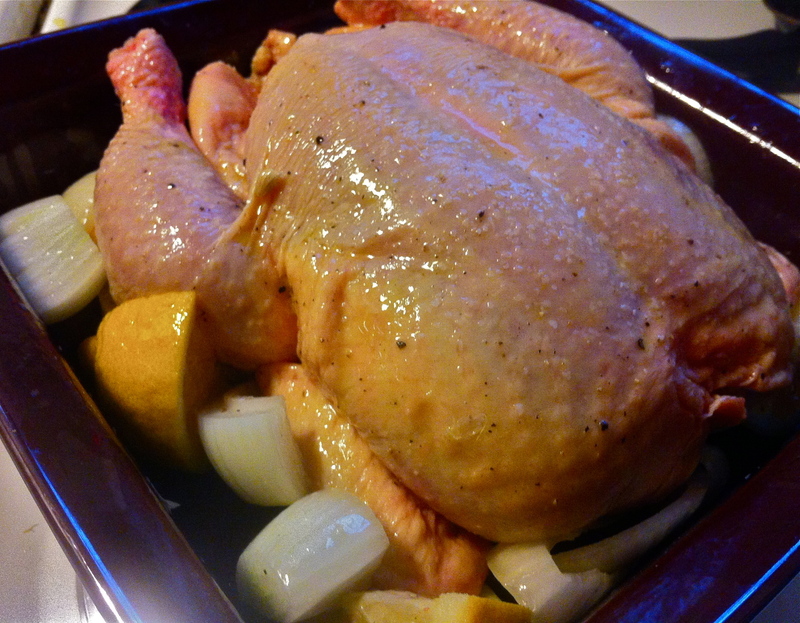 It’s a whole chicken stuffed with lemons and garlic, then surrounded by lemons and onions. 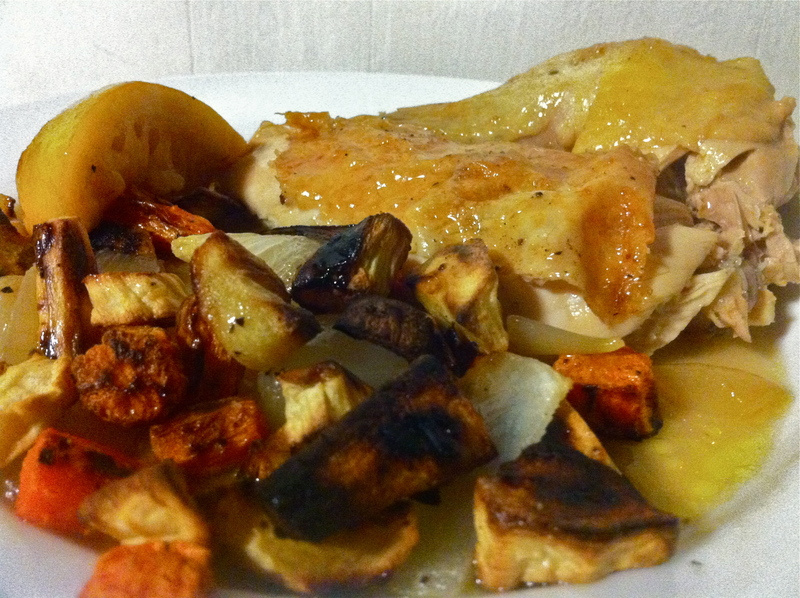 Drizzled with salt, pepper, and olive oil, the chicken was ready for roasting. IT TOOK FOREVER!!!! It’s hard waiting 90 minutes for a bird to cook, but it was well worth it. The chicken was super juicy and full of lemony flavor. The lemons were ridiculously soft and delicious to eat. The chicken skin even got nice and crispy. On the side we had some roasted carrots and parsnips. 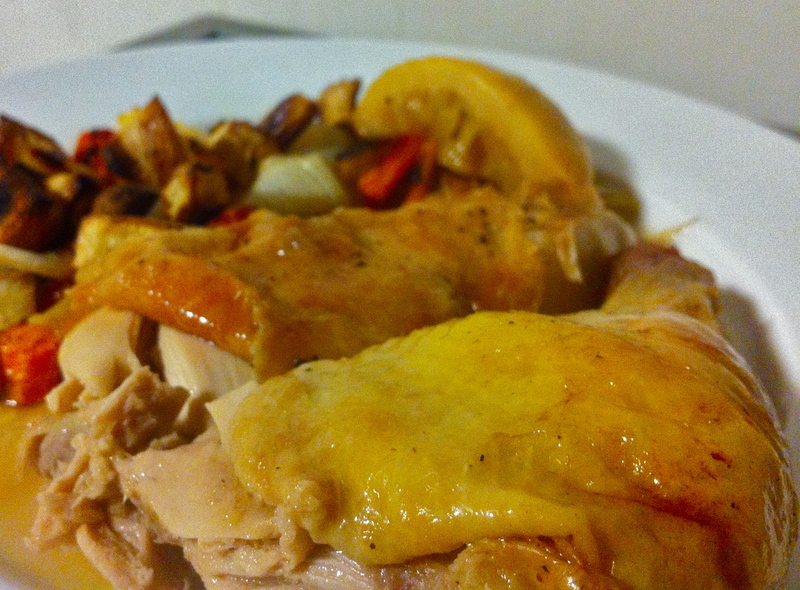 One of the best things about cooking a whole chicken is the abundance of leftovers. Lemon chicken for dayyyyys. My birthday breakfast was something sweet. Though I wanted a huge stack of pancakes, I went with a protein shake. Chocolate protein powder, chocolate almond milk, frozen banana, and some strawberries. So good, and gone so quick I didn’t snap a picture. I was tempted to splurge for lunch. All morning I was thinking about my favorite falafels, giant burritos, veggie burgers, and huge teriyaki chicken sandwiches. 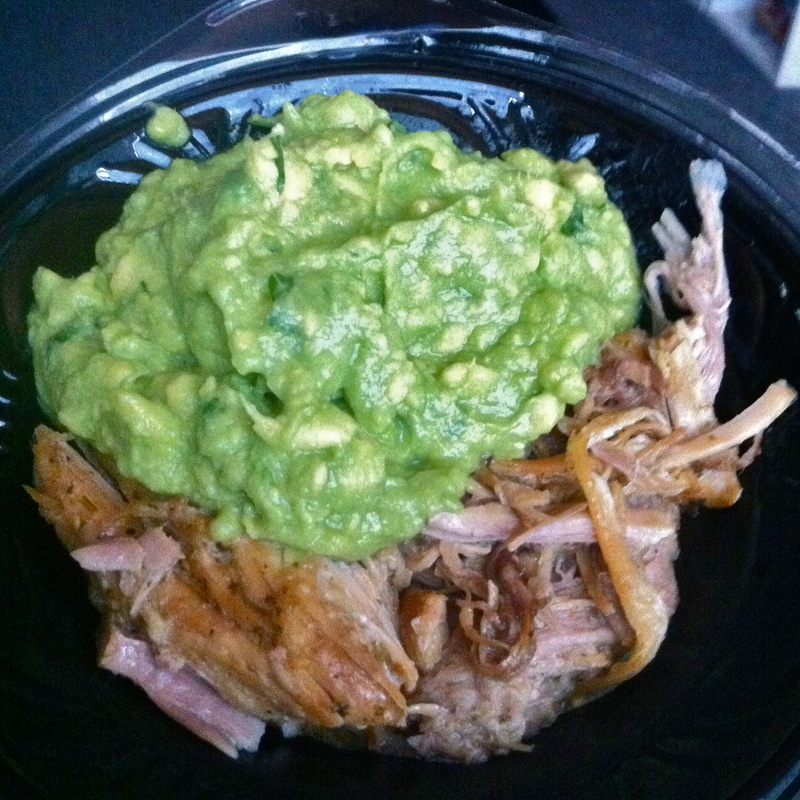 Somehow I played it smart and went with carnitas and guacamole. One bite and I loved my decision. This is sooo good, I love Q’doba. 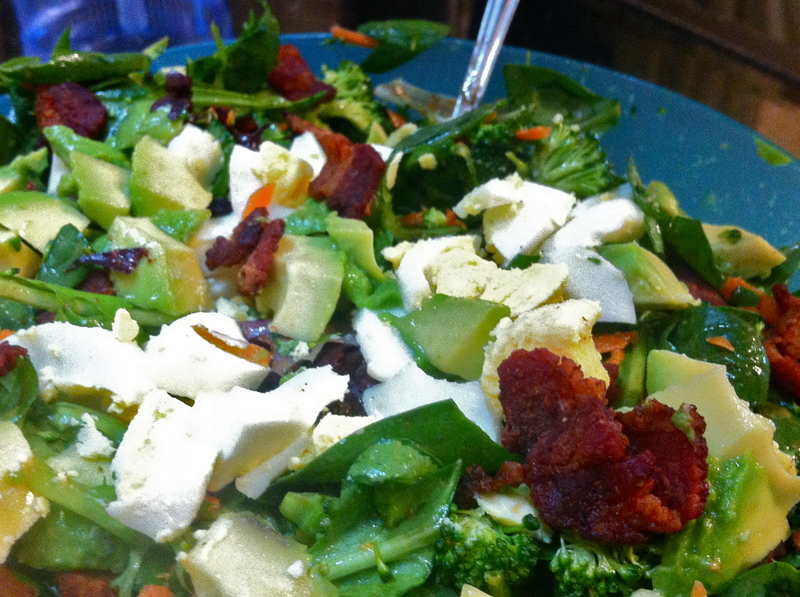 Good thing I went paleo for lunch, because dinner was definitely a faileo. 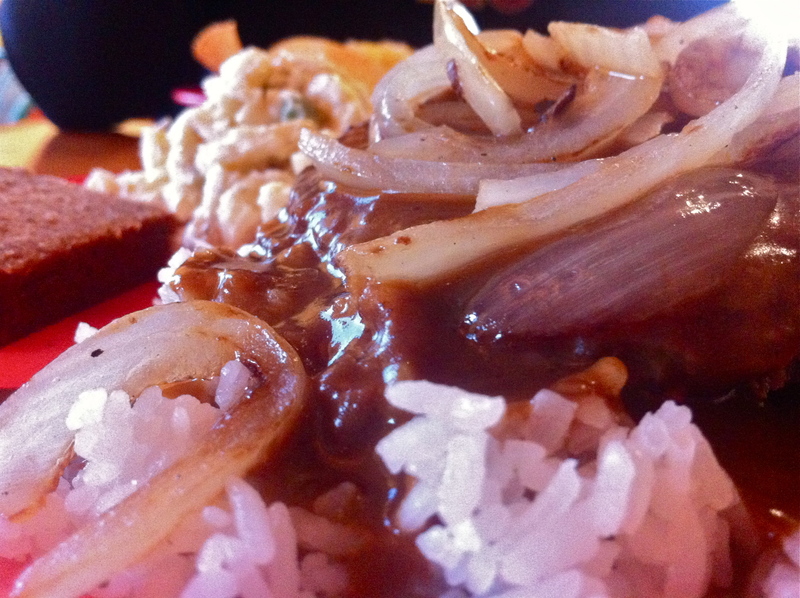 I had one of my FAVORITE all time local meals. To die for. I went with the smaller portion because Lord knows I would have downed the entire thing no matter the size. 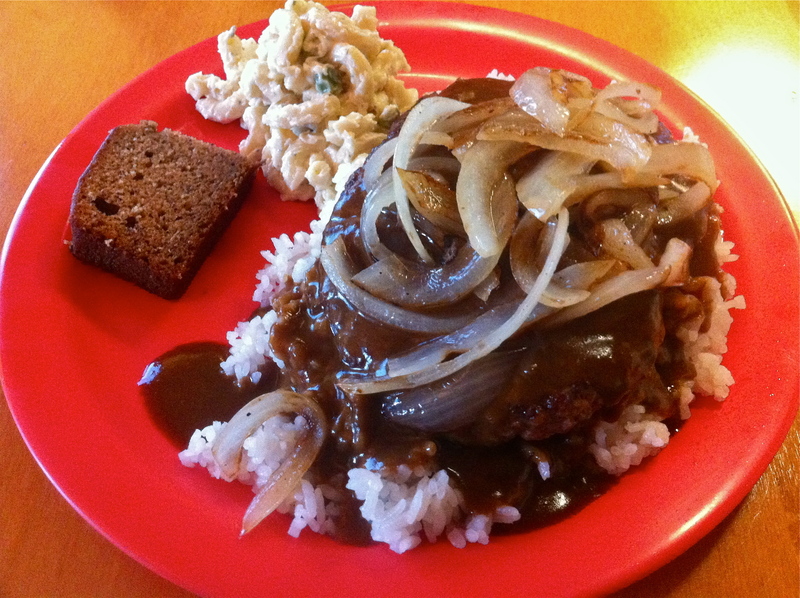 He went with the Hamburger Steak Plate, which was two 1/4 pound burgers on rice, smothered in hawaiian gravy and grilled onions. Wow, this was amazing as well. 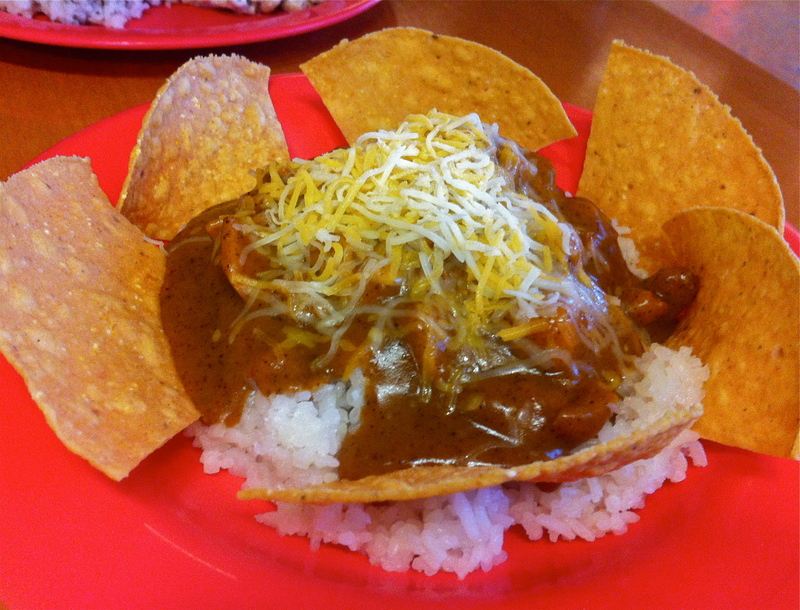 We’ve seen versions of this meal on Diners, Drive-ins, and Dives, so it was fun to “try” it. After a yummy dinner, we went in search of a yummy dessert. The Divine Cupcake won out. The organic and vegan cupcakery is divine (duh) so we couldn’t hold back. 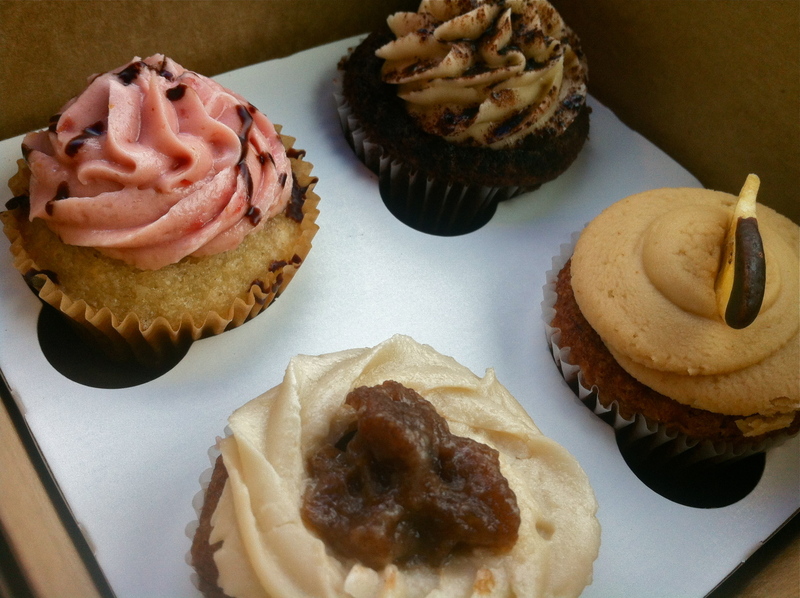 We left with a gluten free vanilla cherry bomb, a banana’s foster, a banana peanut butter, and a chai cupcake. We saved the cupcakes for home, and hit up Target first. My favorite store ever, CJ offered me a birthday shopping trip. 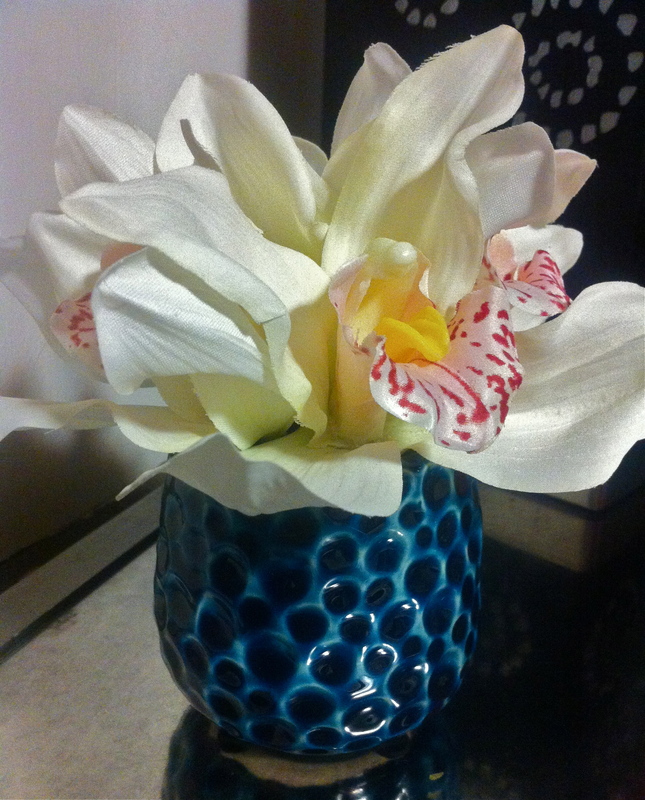 … and some cute flowers for the bedroom. I would have thought the shopping, dinner, and dessert was a big enough gift, but not true in Cj’s mind. He doesn’t seem to understand the concept of modest gift giving. I’m not complaining. 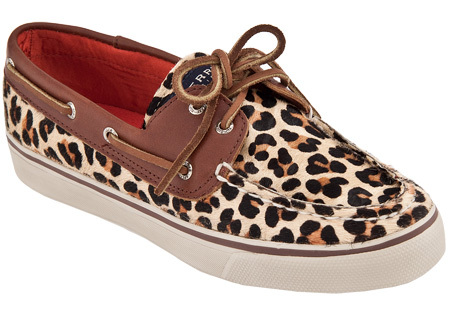 and my dream Leopard Print Sperry’s !!!!! I die!! He definitely outdid himself this birthday, and I couldn’t be more grateful for him and the gifts. And now back to sugar-free reality…. 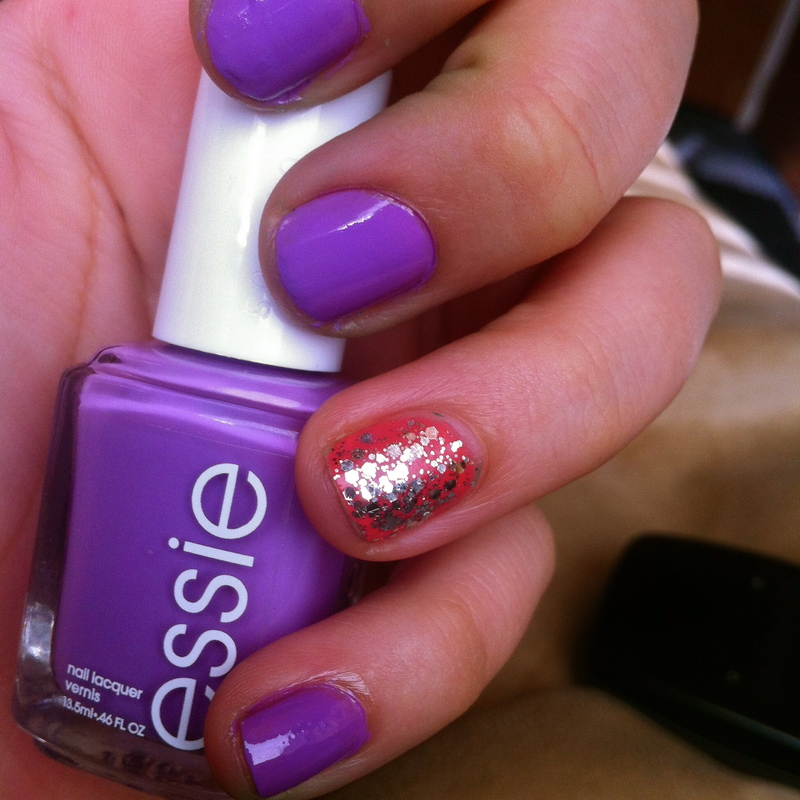 Oh, love the Essie colour. That stuff is so, so expensive up here….but it stays on for freaking DAYS! I have the light lavender purple on my toes right now! Happy Birthday, looks like a really cool day! Thank you !! The switch to wordpress?! I LOVE it, so so sooo much !!!! deff recommend 🙂 Hope you’re doing good ! can’t believe math was a yearrr ago ! 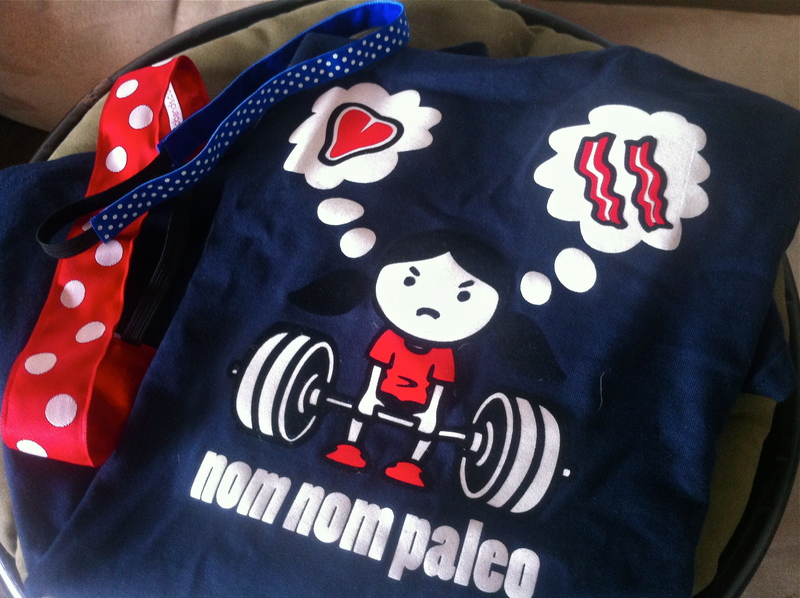 A paleo Faileo! I’m gonna have to use that one! So funny! SOunds like you had a perfect birthday. I just roasted a chicken in the crock pot. Never done that before and it was amazing. Keep up the good work. I wish I’d started eating healthy at your age. 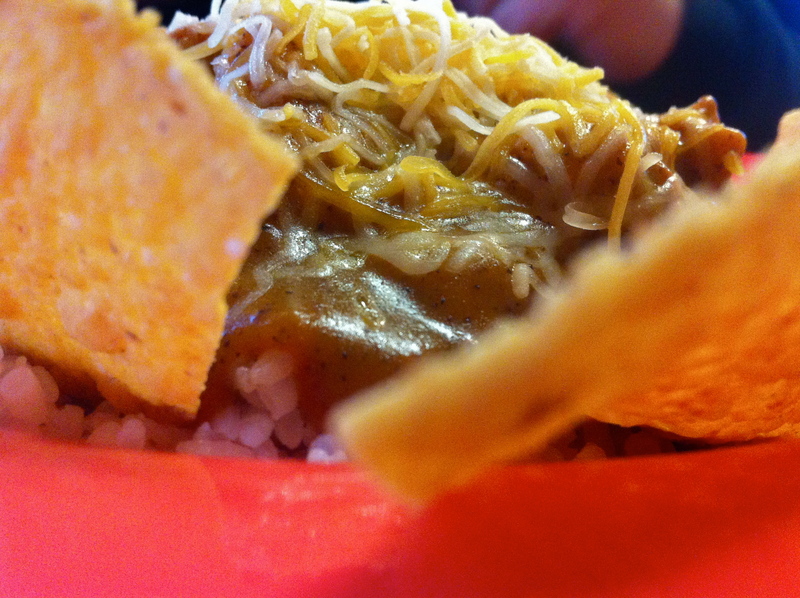 In college all I ate was pasta with marinara, burritos, cereal and beer. I’ve heard about chicken roasting in crock pots, I’ve got to try it!! Healthy now, not so much the first 4 years of college haha your diet back then sounds pretty much like how mine was, heavy on the cereal. Thanks for stopping by! !